Steve Keller left the University of Montana Western in March to take over the University of Providence's men's basketball program. University of Providence head coach Steve Keller walks the sideline during the Argos' game against Montana Tech in Butte on Thursday. BUTTE – How much can change in just one year. 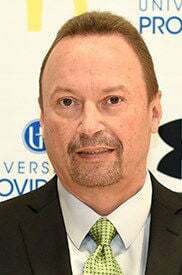 Patrolling the sideline for Providence this year is Steve Keller, who spent the previous 11 seasons at the helm of the University of Montana Western, with his curtain call being a deep run in last year’s NAIA tournament. Providence, meanwhile, spent last season hovering around the basement of the Frontier Conference. Keller’s time in Dillon came to an abrupt end shortly after the season wrapped up, with him accepting an offer to take over the Argos in Great Falls. Speaking to 406mtsports.com before his side took on Montana Tech Friday night, Keller explained how he made the decision to leave the Bulldogs, the emotions of returning to Dillon and the how his team has improved so quickly from last season. The conversation is below in full, edited for clarity. 406: Good step in the right direction for Providence coming off last year, right? Keller: Yeah. We’re in the mix. I like our team, we lost a tough one on Tuesday night on a 3-pointer at the buzzer. And Tech’s a better team, this one is going to be a battle. For you personally, how has the transition to Great Falls been? It’s been great, we’ve got great administration, great athletic directors, and I really like it. Now that you’ve kind of settled in, and you’ve got your team set now -- looking back, how difficult do you feel like it was for you to leave Western? It was difficult but it was strictly a financial situation. It was financial, I got paid a lot more and that’s why I had to leave. I’m getting older in my career and wanted to make a little bit more money so I could do some things and, yeah, it was really hard to leave Western. Great people, I feel we had great players and I’m still pretty close to quite a few of the guys on the team. Yeah? Have you talked to (your previous players)? Oh yeah. We played ‘em last Saturday. You guys got to chat a little bit then? Well on that note then, if you did feel like you had to leave Western, was it important to you to stay in the Frontier Conference? Well, that’s a tough move going in the same league. I would have rather got some other job, but you know, this one was basically offered to me and I accepted it. It was in the league and yeah, it’s not ideal going in the conference you know, but it is what it is. That doesn’t happen very often but I’m totally happy and I like what we’ve got going and yeah, it’s good. What do you think it’s going to be like when you visit Western, when you go back to Dillon? We go there next Saturday. Those are very, very emotional games. It’s going to be really emotional going in there because I have a lot of friends there, and like I said I’m close to some of those guys. But they’re trying to beat me, and we’re trying to beat them. After you guys played for the first time, did you get the chance to talk to (new Montana Western coach Mike Larsen) at all? Providence defeated Montana Western 112-69 on Jan. 5 in Great Falls. A little bit before the game. We didn’t talk much after. He’s working hard there, he’s trying to recruit Montana kids, which we have to do. He’s actually signed a couple pretty good Montana kids in (Dillon's) Michael Haverfield and the kid from Skyview, the 6-10 kid (Zach Schacht), so yeah, he’s a hard worker and he’s doing the right things and he’ll get that going again. (Anaconda graduate) Trent Mikalatos, I know he’s a redshirt for you but he’s one of those guys that when you left for Providence he followed. How’s he progressed? He’s doing good. He’s been redshirting, he injured his shoulder a little bit so he missed quite a few practices but he’ll be ready to go. He’ll be ready to play next year and we like him. We think his upside is huge. Brandon Cotton has been leading the way for you guys as far as points per game, he’s a transfer student? Cotton averaged 19.63 points per game heading into Friday. He transferred from Lower Columbia College. Yeah, he’s a JC transfer. Brandon Cotton and then Jalen Shepard and Austin Starr are both transfers from Vegas, played at the same high school, so they’re one-year guys, they’re our leading scorers. Jalen had 28 and Brandon had 28 Tuesday night against Northern. So our guards are really good, and we’ve got some people inside. We’ve got a good mix. For them being first-year guys with you as transfers, and to come in and buy in and really have been doing good things for you, what have they been doing right? Well, they’re just good basketball players. We got those two Vegas kids late, can’t believe they were sitting out there still, looking for a place to play. We got ‘em, and I’m glad we did, because they’ve been mainstays. Brandon came from Tacoma, Washington. My point guard I had last year, (All-American Dom Robinson), and (former Bulldog) Brandon Brown were from Tacoma, so they all knew Brandon Cotton, and they called him and said come, so that’s how I got him.